Research carried out in the group of Professor David Craik is aimed at developing disulfide rich peptide as drugs. Our work involves both the study of the structure activity relationships of active peptides as well as the design of peptide variants with improved stability and activity. For more information on our groups interests please consult our web page. We are located at the Institute for Molecular Biosciences, at the University of Queensland, Australia. 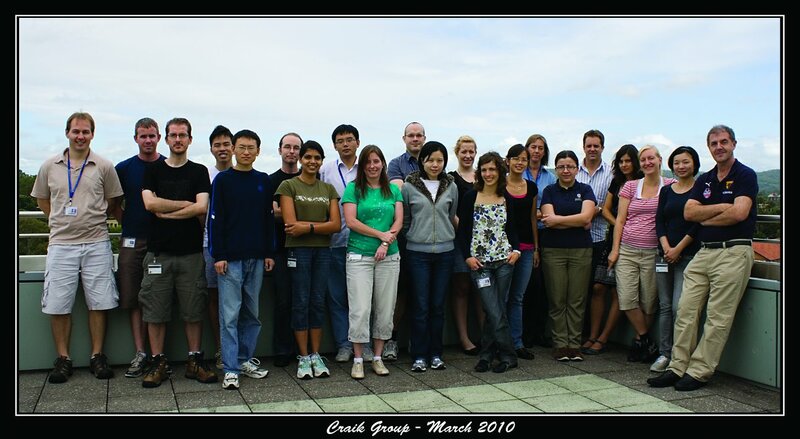 Group members on the picture, from left to right: David Wilson, Phil Walsh, Phil Sunderland, Zai Phua, Wenjun (Peter) He, Quentin Kaas, Uru Malik, Rilei Yu, Norelle Daly, Jan-Christoph Westermann, Yen-Hua (Crystal) Huang, Pippa Smith, Sonia Henriques, Aurelie Chanson, Peta Harvey, Basar Oku, Richard Clark, Laura Cascales, Louise Thorstholm, Chia Chia Tan, and David J Craik.